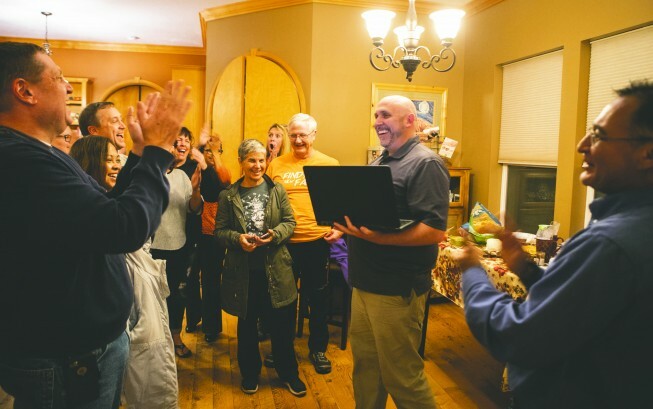 Erik Gumbrecht (center), vice-chairman of the Tooele County Form of Government Study Committee, celebrates with other committee members and well-wishers while watching election results Tuesday night. 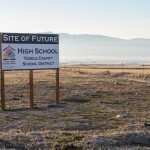 Voters supported Proposition #6, which means by Jan. 1, 2021 Tooele County will eliminate the current 3-member commission form of government for a 5-member council and appointed manager. Dan Clark goes through the steps to submit voter results to the state during ballot counting Tuesday night. Nancy DeMello uses the voter information pamphlet while filling out a ballot Tuesday afternoon. Debbie Smart opens ballots at the Tooele County Clerk’s Office on election night. Form of government change wins! It looks like Tooele County voters want a change in their county’s form of government. 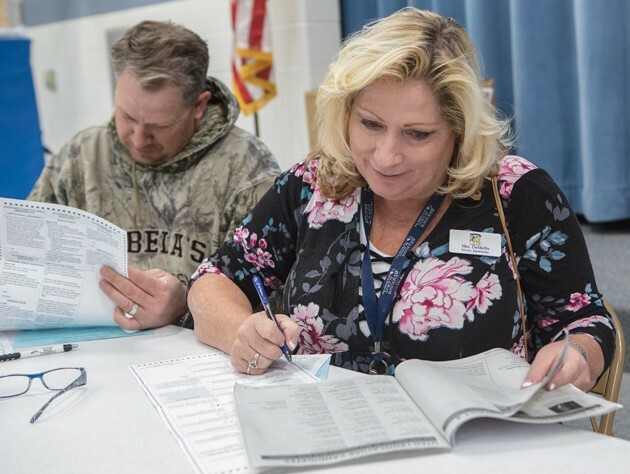 Votes for Proposition #6, which asked voters if they supported the Tooele County Form of Government Study Committee’s recommendation that the county adopt a five-member county council with an appointed manager, held 53 percent of the votes at the end of ballot counting on election night. Maria Sweeten, study committee member, said she was “elated” and appreciative of the voters who understood the committee’s message. The next step to support the change in county government will be the selection of a broad based transition committee that will help implement the study committee’s recommendations as the change moves forward, according to Erik Gumbrecht, study committee vice chairman. The major steps coming up include initiating the recruitment process for the county manager, drawing the district boundaries for the five council seats, and developing inter-departmental procedures. The new form of government will officially start on Jan. 1, 2021. “The study committee is ready to help the commissioners with the transition process,” Gumbrecht said. And there will be two new county commissioners after Jan. 1 to help with that transition process. Two Republicans were elected Tuesday to replace outgoing County Commissioners Myron Bateman and Wade Bitner. Neither Bateman nor Bitner sought re-election. Tom Tripp pulled down 66 percent of the election night vote to be the apparent winner of County Commission Seat A. He faced three third party opponents. 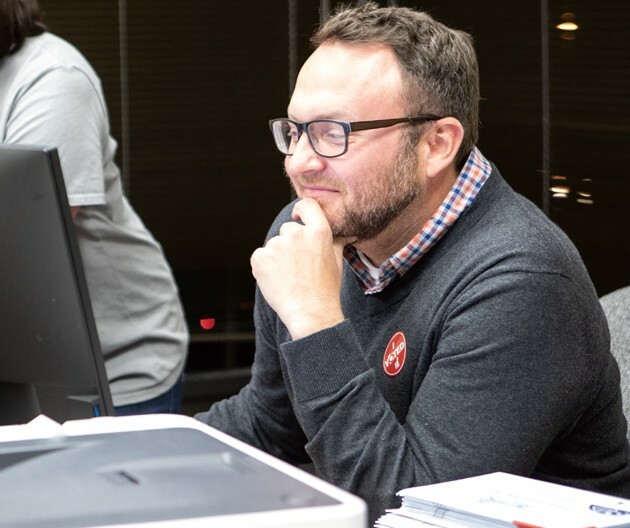 Kendall Thomas, in his third run at County Commission — the first time as a Republican — came away with 61 percent of the vote after Tuesday night’s unofficial tally. Thomas said he was excited to finally win a County Commission election, but changing parties doesn’t mean he has changed. In other county wide elections, voters selected Republican Alison McCoy as the new County Auditor. With 63 percent of the election night vote, she appears to have defeated her Democratic opponent, Sam Woodruff. The Tooele County School Board will welcome two new members in 2019. Both of the new school board members are from Stansbury Park. Camille Knudson held 52 percent of the election night votes to claim the open School Board District #5 seat over Teresa McNeil. Melissa Rich defeated three-term school board member Carol Jensen with 57 percent of the vote for the School Board District #6 seat. Incumbent Alan Mouritsen was unopposed in the School Board District #7 race. If uncounted provisional and late arriving mail-in ballots mirror the election night trend, County Proposition #16, which would have raised sales tax to support public transportation, will be defeated with the “no” vote holding a 1,123 vote lead with 53 percent of the vote. In state Senate races for districts that include parts of Tooele County, incumbent Republican Daniel Thatcher ended election night with 52 percent of the district wide vote for Senate District #12. 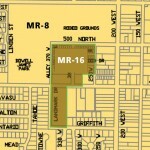 Senate District #12 includes Tooele City, East Erda, Pine Canyon, Magna, and parts of West Valley City and West Jordan. In the Senate District #17 race, Republican Scott Sandall lead his Democratic opponent with 78 percent of votes counted by the end of election night. Sandall will replace retiring Republican state Senator Pete Knudson. Senate District #17 includes Lake Point, Stansbury Park, West Erda, Grantsville, Wendover, Dugway, Rush Valley, Vernon, Ophir, and parts of Box Elder and Cache counties. In state House of Representatives races, voters in House District #21 have retained Republican Doug Sagers with 64 percent of the vote. House District 21 includes Tooele City, Pine Canyon, and part of Stansbury Park. Voters in House District #68 supported incumbent Grantsville resident Merrill Nelson with 72 percent of the votes district wide. House District #68 includes Lake Point, part of Stansbury Park, West Erda, Grantsville, Wendover, Dugway, Rush Valley, Vernon, Ophir, Juab and Millard counties, and part of Utah County. 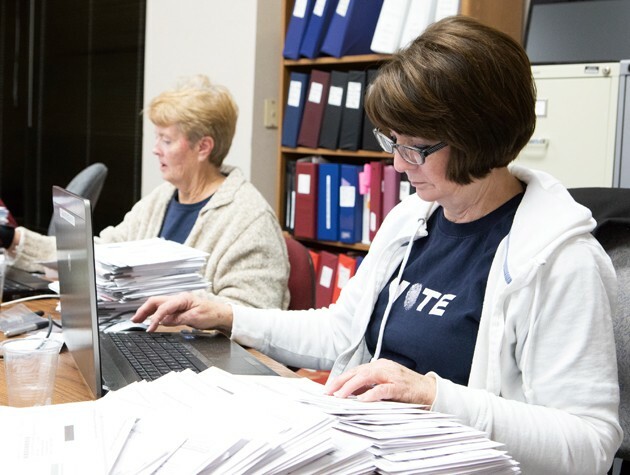 With somewhere around 2,000 provisional and an unknown number of mail in ballots that may arrive before the final vote tally, the results for close races may change. In past elections provisional and late arriving ballots tended to follow the same trend as votes counted on election night, according to Gillette. However, with this being the first all vote by mail election, Gillette said she wasn’t going to make any predictions. The final vote count will be completed in two weeks, she said. 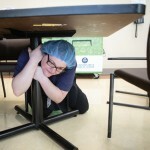 This story will be updated as updated vote tallies are available.